President called the meeting to order at 5:35. Club Leader welcomed the new people. VP led the 4-H pledge. Member and Member showed everyone the handshake. VP reviewed Robert’s Rules of Order. Secretaries read and got approval for the minutes. 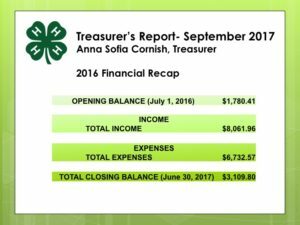 Treasurer did the treasurer’s report, approved the budget and told everybody what the clover buds were. Club Leader thanked the chicken coop crew. Some of the kids talked about the cake booth. Member read his poem “Pig Magic” that won a prize at the County Fair. Lots of kids talked about “Las Posadas” 4-H camp. Club Leader talked about the Mini-Maker faire. Club Leaders introduced the new idea for Houses. EBI Head of School talked about how to clean up after the meetings and the necessity of having a point person adult for each child. 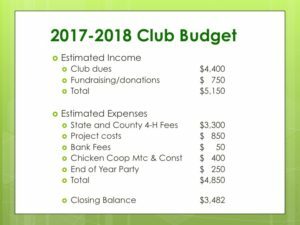 Club Leader talked about the new projects and the new 4-H website with the enrollment process. Project Leaders reviewed their projects: Incredible Wearables, Knitting, Basics of Baking, Plant Potions, Weaving and maybe Leathercraft in the Spring, Arts & Crafts Fundraising for Chickens, First-Aid, Chickens & Eggs, Farm Park Exploration. President mentioned a few other spring projects to come. The meeting ended at 6:45 pm.